Two juvenile rhesus macaques cuddle in the lush and abundant vegetation before Hurricane Maria. Cayo Santiago is a small island (thirty-eight acres) off the southeast coast of Puerto Rico. It has been home to a population of rhesus macaques, Macaca mulatta, since 1938, when 409 monkeys were imported from India to establish a colony of Old World monkeys for study in the Western Hemisphere. No tourists are allowed on the island, but researchers and staff of the University of Puerto Rico Caribbean Primate Research Center, which runs the field station, visit the island daily. So, the monkeys—now, over 1,000—are habituated to human presence. Over the past eighty years, numerous studies carried out on Cayo Santiago’s monkeys have made major contributions in fields both inside and outside primatology. Rhesus macaques, highly social primates, are a model species for studying topics that affect humans. 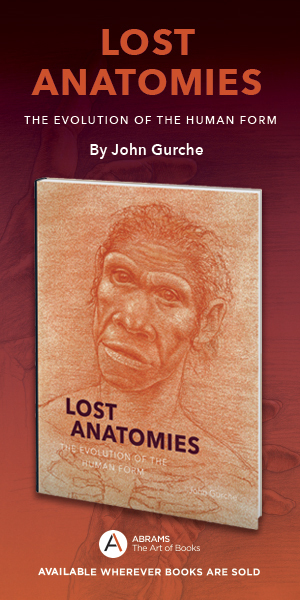 Their genetic similarity to humans have made it possible to study the heredity of certain shared traits and conditions; their cognitive abilities give insight into development and cognition; and their social behavior and structure, strikingly similar to humans, allow for studies on the evolution of sociality. The main advantage to Cayo Santiago over other primate research centers is that the study population isn’t restricted by anything other than the natural confines of the island. The subjects are free roaming, inhabiting a relatively naturalistic field setting. Likewise, there is a full, multi-generation genetic and familial database for all individuals on the island, allowing for a depth of research that is rare in fully wild field sites. Research on Cayo has been advancing such fields as genetics, longevity, infant development, cognition, endocrinology, and sociality. 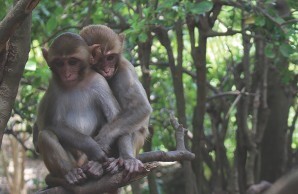 Recent research has been at the forefront of understanding the evolutionary origins of friendship, stress, and aging; current long-term studies are focusing on understanding cognitive development, autism, and, more broadly, understanding the genetic underpinnings of behavior and sociality both in macaques and in humans. For decades, this population had been studied year-round, uninterrupted—until September 20, 2017, when Hurricane Maria struck Puerto Rico and put the future of Cayo Santiago in jeopardy. The storm arrived from the southeast, making landfall on Cayo Santiago and the entire southeast coast of Puerto Rico, including Punta Santiago, the town where Cayo Santiago’s headquarters and many staff members and researchers are based. It brought sustained winds of 155 mph, heavy rainfall, and waves that battered the coasts for hours. The storm knocked down almost all cell towers, indiscriminately destroyed structures and roads, and flooded coastal areas, sweeping away cars and debris and leaving all of Puerto Rico in a state of emergency. Hurricanes are a normal and seasonal occurrence in the tropics, but people who lived through Maria say that this storm was a different beast; unlike anything they’d experienced before. A glimpse of the destruction caused by Hurricane Maria. 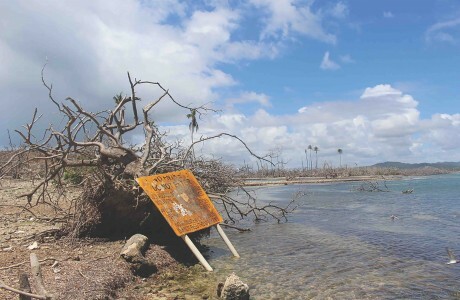 One of the battered signs warning against unauthorized entry to the field site now leans against dead vegetation as its normal location has been underwater since the storm in September 2017. 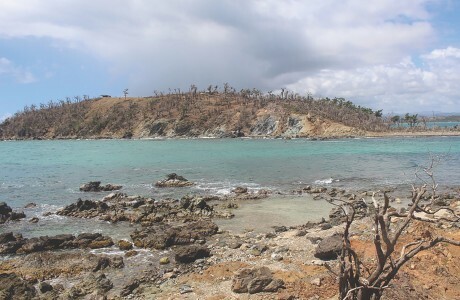 Immediately after the storm hit and the gravity of the situation became clear, the principal investigators of research on Cayo Santiago—a small collection of faculty members based at universities throughout the United States and the United Kingdom—digitally connected to discuss their options. A pressing concern to all Cayo researchers was to find out whether any monkeys had survived the impact. The lack of communication with people on the ground and the complete devastation of Punta Santiago made chartering a helicopter the only option to capture footage of the island in an attempt to evaluate the situation. To everyone’s surprise and immense relief, the helicopter footage showed that at least some of the monkeys had survived, although the island was clearly in bad shape. From the air, the once deep green of Cayo was now completely brown, and the few structures previously on the island were gone. Most alarming, the rainwater collection and distribution systems were destroyed, leaving the surviving population without fresh water. 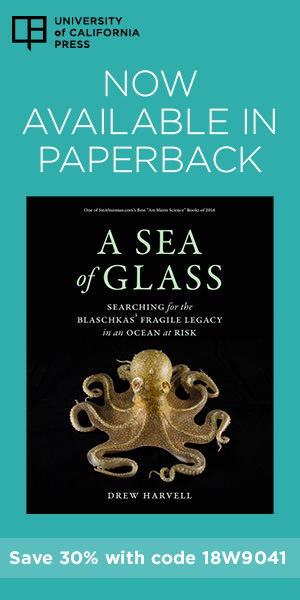 While it was a huge relief to know that decades of ongoing research hadn’t been wiped out by the initial impact, the footage also made clear that immediate and drastic action was needed to keep the population alive. Within twenty-four hours, the principal investigators implemented a plan of action. They launched two crowd-funding campaigns—one for the staff and their families and one for the monkeys—which quickly gained momentum in the scientific community and spread to a much larger audience, drawing donations from around the globe. The principal investigators also committed funds from their home institutions to ensure that the monkeys—and decades of current and future long-term research—did not dissolve before their eyes. Personal donations from scientists, students, families of Cayo alumni, and the public continued rolling in weeks and months after Maria. Without this outpouring of financial support, coordination, and action, the monkeys and research at Cayo Santiago would not have survived. The dedication of the Cayo Santiago staff was the other critical force in saving the monkeys. Taking action immediately after a natural disaster wasn’t without sacrifice; many of the Cayo staff members were personally devastated by the storm and needed to keep their families safe and healthy. Many lost cars and suffered serious damage to their homes, and all the staff was left living without electricity, running water, or cellular service. They had to wait hours in line for a ten-dollar ration of gasoline in the days and weeks after Maria. Nevertheless, the staff members chose to sacrifice their time and resources to keep the monkeys alive, promptly and efficiently finding ways to address the immediate needs of the monkeys in the midst of devastation both on Cayo and on “mainland” Puerto Rico. The town of Punta Santiago was, and still is, heavily damaged by the storm. Docks were in shambles, so for months the staffers had to walk chest-deep into the ocean to reach the motorboat, carrying bags of food over their heads and jumping in and out of the boat on both the mainland and on Cayo. With Cayo filled with debris and with the island’s truck and ATVs destroyed, the staff fed the monkeys on the beach, directly from the boat, manually transporting the food and spreading it along the beach for the various social groups to have access. With the community of Punta Santiago suffering heavily, Cayo alumni based in the U. S. packed and sent donations of emergency supplies to keep the staff and the community functioning during these months. As conditions began stabilizing on the mainland, running water returned and gasoline became more available. Staff members, most still without electricity, were slowly able to shift from focusing on immediate survival—for themselves and for the monkeys—and start rebuilding Cayo Santiago. The few remaining cisterns, serving as artificial watering holes, were opened and equipped with structures to allow the monkeys to climb in to drink and get back out. As masses of debris were eventually cleared and paths were opened, the staff started feeding the social groups in their usual spots. Donations allowed for the purchase of a new truck for the island, as well as a “floating dock,” large plastic air-filled platforms on which the staff loaded the truck and towed it across from Punta Santiago to the island. Other pressing needs on the island included a new outhouse, ATVs, new structures for the storage of food, tools, and gear, and of course, a new water collection and distribution system. These were purchased by donations and built by the staff during the months after Maria, slowly restoring the basic functionality of Cayo Santiago for research. Two groups of volunteers, one in December 2017 and the other in April 2018, also helped with the inordinate amount of work left to do to rebuild Cayo Santiago. To date, the monkeys are doing well. The population loss from Hurricane Maria was minimal: less than 10 percent of the population disappeared during the storm, and mortality rates afterward were not significantly higher than normal. Despite the drastically changed landscape that still persists, the monkeys seem to be back to their usual routines. Their days follow the same pattern of eating and socializing throughout the morning, then settling down around midday to rest and groom with friends, family, and potential mates. Rhesus macaques are known for their resilience and adaptability to different environments and diets, but nobody–even the Cayo researchers and staff who know them well–expected them to survive and even thrive under these conditions. Two-thirds of a year after Maria struck, there are signs of new growth and recovery on Cayo, but the field site is still vastly different from what it once was. Now, instead of lush green vegetation bordering the sandy beaches and filling the island, dry and dead mangroves and plant detritus line the beaches. Dead, leafless trees, both fallen and standing, fill most of the island. Patches of green are just beginning to appear on some of the remaining vegetation. The majority of the mangroves, once shady and teeming with crab—a favorite spot for the monkeys—are gone, and the isthmus that once connected the two parts of the island is still underwater. Things have settled into a new normal here on Cayo, but the storm has left some major changes that could be affecting the monkey population in ways we don’t yet understand. The predominant and persistent difference between pre- and post-hurricane Cayo has been the lack of shade. Areas that had been shaded by vegetation or trees are still completely barren and in direct sunlight all day long, making midday temperatures borderline unbearable. Understanding the effect of this lack of shade is part of my current research, which is generally aimed at assessing the effects of Hurricane Maria on the social networks of the monkey population. This research is just underway, so we don’t yet know how or if social networks have changed since the storm. A rhesus macaque rests in one of the few shady spots remaining after Hurricane Maria. Anecdotally, there does seem to be some difference in how, when, and the degree to which individuals socialize. 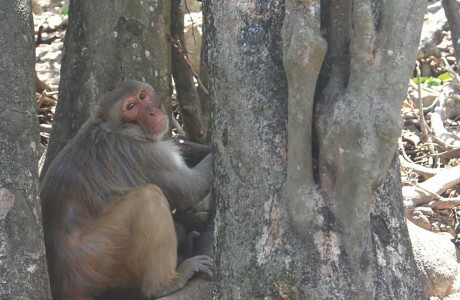 The lack of shade could be forcing monkeys to rest and socialize in proximity more often than when shade was abundant. Perhaps the increased grooming frequencies that we’re observing are an exchange of social capital; grooming may be exchanged for tolerance by high-ranking individuals to resting in the few shady spots. Or perhaps grooming has increased as a coping mechanism: it has been shown that it helps to decrease physiological stress indicators, possibly indicating that the monkey population is dealing with the effects of the storm through grooming. Additionally, the clustering of individuals in the few shady spots could be changing the quantity of closeness and quality of social relationships within groups, potentially altering their social networks. Another major and persistent effect of the hurricane has been the lack of reliable fresh water on the island. The water collection and distribution systems have been a primary focus since the storm’s aftermath, but the long rebuilding process, combined with the particularly dry season directly following the hurricane season, has made fresh water availability unreliable on some parts of Cayo. This restricted fresh water access, particularly affecting the lower-ranking social groups on the island, has led to some odd and potentially troubling behavior. Since the storm, researchers and staff have noticed monkeys drinking ocean water, a phenomenon never before seen on Cayo. We’re also seeing monkeys dipping their food in ocean water before eating it, which is reminiscent of Japanese macaques “washing” sweet potatoes in seawater. In the case of the Japanese macaques, this phenomenon is not present in all groups and was not always present in the group where it currently exists. Rather, it has been generally accepted as a cultural phenomenon, a behavior that arose with one individual and has since been passed down for generations within one population. While we don’t yet have the data to show that this is the case on Cayo, we are noticing that as the rainy season approaches and fresh water has become widely available, some monkeys are still drinking ocean water and dipping their food in the salt water. We’re seeing high-ranking individuals in high-ranking social groups perform this behavior despite now having essentially unlimited fresh water access. Perhaps this behavior arose out of necessity after the storm but is continuing for other reasons or is indicative of something we don’t yet understand. This behavior is certainly unusual and is being studied as part of how the population has been affected by the storm. The rebuilding of Cayo Santiago is by no means complete. Throughout this process and going forward, the primary goal is to rebuild the site with resilience in mind. Climate change models have predicted an increase in frequency and intensity of tropical storms, stressing the need to take action now to ensure the future of Cayo Santiago as a field research station. Some factors are out of human control, such as the rate of vegetation recovery, which is predicted to take years, or decades. The strength of future storms is another huge unknown, but the rebuilding efforts underway are working toward making Cayo able to weather future storms of Maria’s magnitude. The current primary goals are restoring the structures needed to conduct normal research, such as feeding corrals and an on-site lab, and solidifying a resilient water collection system. Much of the funding and logistics for these projects are still undetermined. Although we don’t know the exact timeline of how and when the site will be fully recovered from Hurricane Maria, what is clear is that continued support will be critical to the complete reestablishment of this unique field site and its invaluable research. Walking down the dock every morning—well, walking along the line of plywood sheets on one side of the destroyed dock every morning—is a daily reminder of how much work has yet to be done.